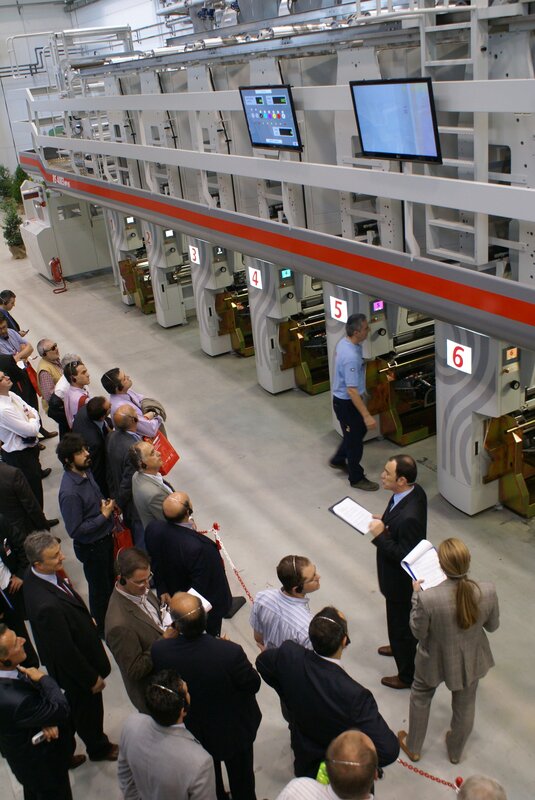 The CL 850 coater/laminator demonstrated at the recent Bobst Rotomec open house runs at 1,400 fpm. The new RS 4003 MP HS gravure press for medium to long runs of printed materials. It achieves speeds of 1,600 fpm and features a new printing-trolley design for quick changeover of the whole inking system and gravure cylinder, or alternatively, of only the gravure cylinder. A 6-color job on 12-micron PET film was demonstrated along with the new TAPS (Total-Automatic-Pre-Register-Setting) sequence. Less than 350 ft of waste material was generated. 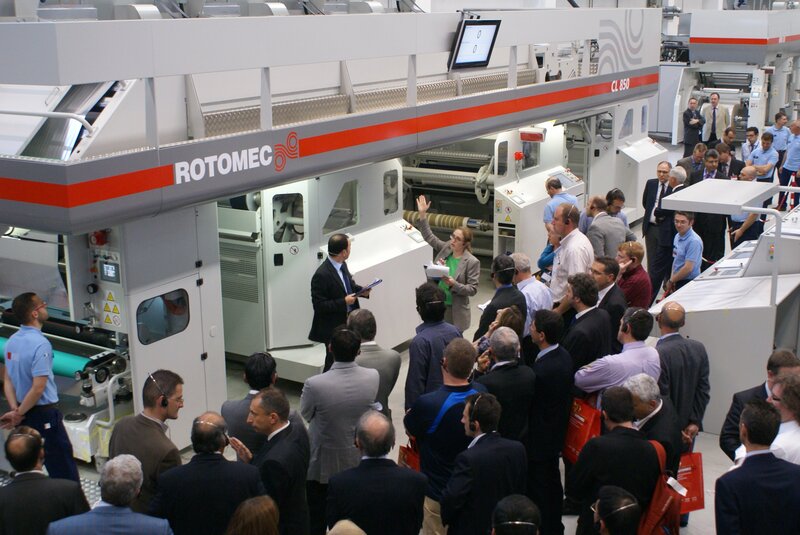 The Bobst Rotomec RS 4003 MP HS gravure press was demonstrated with the new TAPS (Total-Automatic-Pre-Register-Setting) sequence. The Rotomec MW (Minimized Waste) 80 gravure press. Shown printing a 6-color job on 20-micron BOPP film, the 800-mm-wide MW press is aimed at short-run production. Job preparation is entirely done on floor level by a single operator using the TAPS system. The Rotomec SL 850 solventless laminator. The duplex-configured unit ran two clear 20-micron BOPP films with 1.8 gsm of solventless adhesive at 1,900 fpm. A flying splice was performed at full web speed. The Rotomec CL 850 duplex laminator. The system, with more than 30 installations worldwide, features the Rotomec flexo-coating system and was shown laminating a 6.35-micron aluminium substrate to a 12-micron PET film. The CL 850 enables a lower coating weight of solvent-based adhesive at speeds to 1,400 fpm; it also performed a flying splice at full web speed. A second line for PET films (capacity of 26,400 metric tons/yr) in Mexico with startup in Q1 2011. A PP and polyester film project in Egypt (35,000 metric tons/yr of BOPP film; 30,000 MTA of PET; 12,000 MTA of CPP) with complete startup in Q3 2011. Total cost about US$135 million. Expansion of Indian capacities for flexible-packaging products involving a total investment of around US$60 million, expected to be fully commissioned by Q1 2011. This entry was posted in coating/laminating, flexible packaging, package printing and tagged converting, flexible packaging, gravure, labels, packaging, plastic film. Bookmark the permalink.